Deanna Durbin, a singer-actress who, as a child star, became one of the biggest box-office attractions of the 1930s and ‘40s has died at the age of 91. The announcement of her death was made by her son, Peter H. David, in her official fan newsletter. Durbin made her movie debut at 13 in an MGM short, Every Sunday (1936), in which she co-starred with a 13-year-old Judy Garland. Durbin had originally signed with MGM because the studio was planning to make a movie starring the opera singer Ernestine Schumann-Heink, and it was looking for someone who could play her as a child. Every Sunday gives a hint as to how Durbin’s career might have developed at MGM: In the film, the two girls perform at a Sunday concert at the park, and while Garland belts out a swing number, Durbin sings a classical aria. But Schuman-Heink died before she could make her MGM debut, and while Louis B. Mayer was still debating whether he needed two girl warblers under contract, Durbin was snapped up by Universal Pictures. Her first feature was Three Smart Girls (1936), in which she plays one of three sisters plotting to reunite their divorced parents between songs. It was also the first of several pictures she made with producer Joe Pasternak, who specialized in sugary, squeaky-clean family entertainment. Pasternak and the studio chiefs realized they had something special in Durbin as soon as they saw the early rushes, and quickly pumped up her role to reshape the picture into her own starring vehicle. The success of Three Smart Girls has often been credited with saving Universal from bankruptcy. After 1941’s It Started With Eve, Pasternak jumped studios and went to MGM, and Durbin initially chafed at the material Columbia offered her in his absence. The studio responded by putting her on suspension, but it finally agreed to give her control over her songs, scripts, and directors. She soon made The Amazing Mrs. Holliday (1943), featuring uncredited direction by Jean Renoir; His Butler’s Sister (1943), with the classic romantic director Frank Borzage; the thriller Christmas Holiday (1944), with noir director Robert Siodmak; and the 1944 musical Can’t Help Singing, which featured songs by Jerome Kern and E. Y. “Yip” Harburg. By this time, her image had become an inextricable part of international World War II-era popular culture. It was common knowledge that Winston Churchill claimed Durbin as his favorite movie star, and Anne Frank had a picture of her on her bedroom wall. But by the time Durbin was in her early twenties, she was feeling increasingly limited by her image. As Pauline Kael wrote of 1945’s Lady On A Train, “The film betrays an obvious uncertainty about how the public wants to see its Deanna. One minute she is just a little girl in pigtails lost in a great big raincoat, and the next minute she is a may-curved siren crooning ‘Give Me A Little Kiss, Will You, Huh?’ in a strange, guttural manner evidently intended to suggest that passion has got a stranglehold on her.” By that time, Durbin was on her second marriage—this despite the urging of studio publicists that she reconsider plans to divorce her first husband, because it went against audience perception of her as a perpetual innocent. In the end, Durbin retired from the screen after 1948’s For The Love Of Mary (directed by Fred de Cordova, later best known as the longtime, sometimes onscreen executive producer of The Tonight Show Starring Johnny Carson). Afterward, she steadfastly refused all requests that she return to the limelight. Her second marriage ended too, but in 1950 she married Charles David, the producer-director of Lady On A Train, and they stayed together until his death in 1999. The few interviews she granted in her later years indicated she was extraordinarily sensible about her fame and the reasons for it. 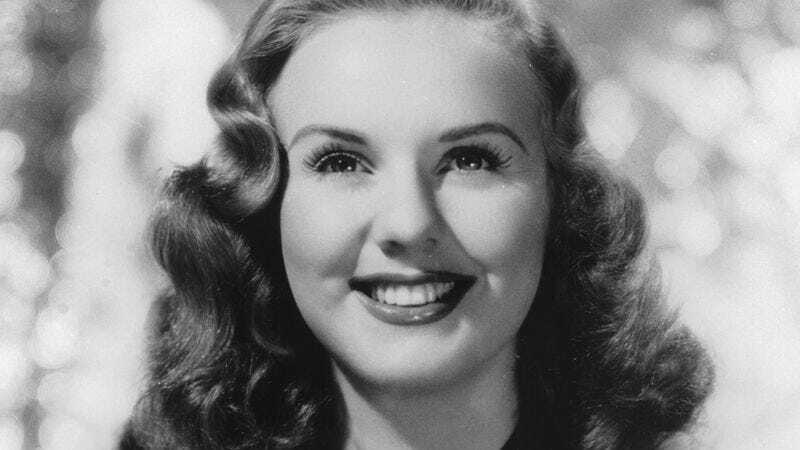 She often referred to “Deanna Durbin” as a character she played in the movies and in their attendant publicity, a character that had “little or nothing in common” with—and no appeal for—actual young girls. Her appeal, Durbin said, was for older audiences who saw her as the “perfect daughter,” which she played right up until she left the nest for good.